I so love this book! I have read it multiple times and this is the first time I have listened to it. It came alive for me in a different way. The strength of the life bond and the beauty of new love. 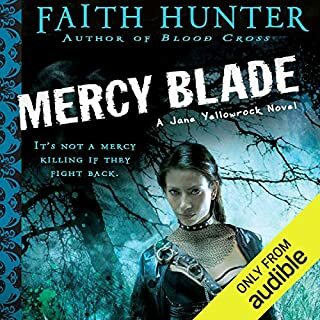 I appreciate how Fatih Hunter develops & introduces new characters & the Mercy Blade character is another layer of fascination in the vampire world Faith Hunter is developing. Quite honestly, I cannot think of another series that has captivated as much as this series has. In fact, I cannot imagine why a platform like Amazon or Netflix hasn't done everything they can to secure the rights to these stories & bring them to life. There are not nearly enough strong female characters on film these days & vampire world or no, it's time for a lot more characters like Jane Yellowrock. Thank you Fatih Hunter; keep this up! The Jane Yellowrock character is strong & passionate about the nature of her work. She is also a loyal friend & the love she has for Molly (her best friend) & Angie-baby (Molly's daughter) touch the heart. This is a character anyone would want on their side; someone who struggles with her past & present, as well as someone who desires to grow & fully explore more of who she is & where she comes from. 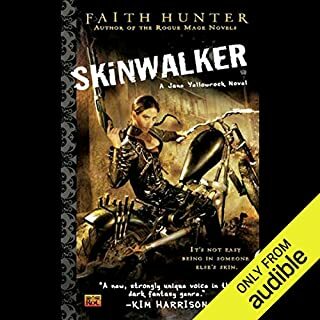 I cannot get enough of this series; I desire Faith Hunter continue this as long as possible...there isn't any reason Faith Hunter couldn't keep this series going for years to come. Especially as she continues to explore Jane's Cherokee roots & potentially, Jane's role with the witches or in Angie-Baby's life, as Angie-baby grows into her potential. 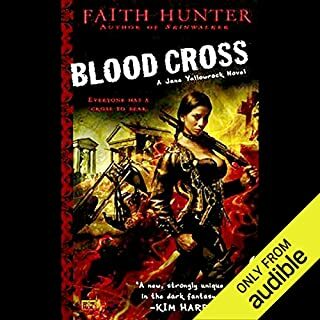 Keep it up, Faith Hunter - this is an exciting & wonderful series. 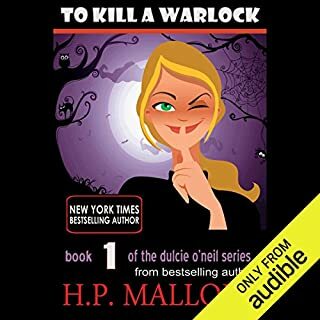 This is a top favorite series, in fact - probably the favorite of all the series downloaded to date. I should have written this first review much earlier & prior to my first review of this series (which was for book 8). As I've already shared, this is one of the best series written for this genre. The primary character is a strong female lead & someone I'm ever interested in learning more about. 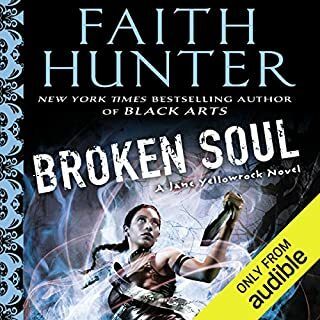 Faith Hunter is building what I believe are unique opportunities to fully develop not only her main character, Jane Yellowrock, yet also many of the other characters as her stories progress. Each story leaves me believing it's better than the next and always craving more! I am unsure about this series; I'd looked forward to the opportunity of getting to know more about the main character & the few other (regularly) supporting characters. However, this tale seemed more frenetic & disjointed - almost as if the author was unsure where to take the story & even more so, unclear as to which characters should have more supporting roles. 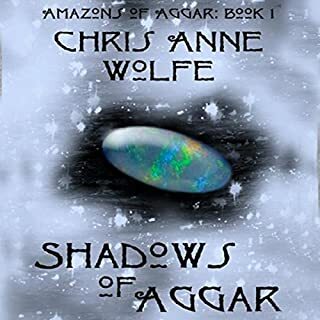 As stories (and characters) go, there isn't a lot or consistency or depth yet again, I started this series because I was looking for something that wasn't too heavy & offered a bit of amusement. I'm unsure the series has the potential for the long term commitment I was looking for & others reviews are mixed. Therefore, I'm going to take a bit of a hiatus, check out another of this author's series & decide then whether or not I'll complete this one. 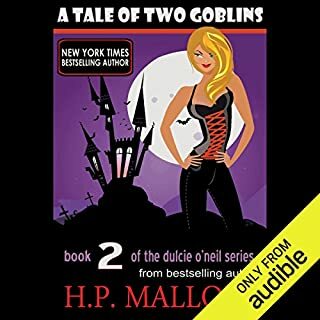 I'm looking for a series that isn't too heavy & offers a bit of amusement with the potential for a long term commitment - I think this may fit the bill. The main character appears somewhat naive yet towards the end, appears to grow a bit & certainly begins to relish in a changing attitude. I'll listen to more & see how she, along with my interest, grows. Truly, one of the best series written for this genre. Each story building & better than the next. I certainly wish the series could go on forever. Great characters and most importantly, a strong female lead. Kudos; applause; hear, hear!